A number of system are set up so that assessment information or consultation information can be linked to an injury record or a medical record (called Related Events). Previously, you had to enter in a new record and save it before you could access the "Related Events" at the bottom of the page. Now, your system builder can set your event form to have a "save and continue" button that saves the record and leaves it open while the Related Events appear for you to access and enter. To previously access any Related Events or even some (Doctors) SOAP notes you needed to save and close the record (as shown here) and then open the record again (shown below) and then add in additional assessments or consultations etc. The Save and Continue works the same way as a "Save and Close". By clicking "save and continue" the record will be saved on the system as an actual record, however it is kept open to enable Users to continue editing the record as well as to access any forms or assessments which are only accessible upon saving the record. The save and continue button removes the need to save the record, reopen it and then enter in the assessment details. It also works as a safeguard against entering in the wrong dates for assessments when you need Related Event data from the assessment to pull back into your SOAP notes (as shown in the steps below). 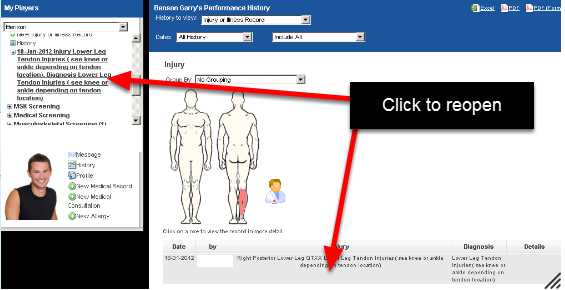 The Record is saved when "Save and Continue" is clicked and the Related Events are Automatically available to be entered, e.g. the Medication, Medical Consultation form and the Musculoskeletal Screening form. You will have different assessment to complete, but the work flow will be the same. The example below shows that a Medical Consultation is completed as a related event. If your system is set up to pull data from a related event form into the SOAP notes, ensure it is date matched. The example shows information being pulled into the SOAP table row when the date in the SOAP row matches the date in of the related event entries (e.g. Medical Consultation entered on the 18-01-2012 matches the 18-01-2012 row). The Save and Continue speeds up data entry when a form has Related Events, or SOAP tables that cannot be accessed unless the event is first saved on the system. Prev: All Images attached to an Image Field Types now appear as a Thumbnail in the Event Form.